They call Wolfeboro the Oldest Summer Resort in America for a reason! Downtown is just steps away from campus and provides students with access to resources year round. From picking up supplies at the grocery and drug stores to shopping and eating out with friends, students always have something to do! Wolfeboro offers visiting parents and families a variety of places to stay and eat while they are here. For local lodging, see our Visit Wolfeboro page. Top 10 Things to do in Wolfeboro! Every year students take part in traditions and events that are special and unique to Brewster and our Wolfeboro location. 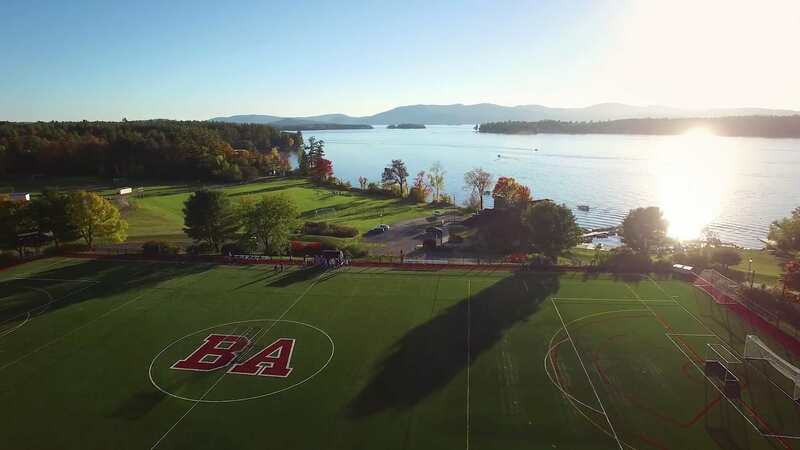 Here are the top 10 things you should try when you are a Brewster student! That's right - the lake is your classroom! Our Freshwater Ecology class departs the dock bright and early on a pontoon boat to study the Lake Winnipesaukee watershed and other local bodies of water. Sign up for an outdoor adventure weekend activity. Become a school leader and attend Leadership Camp at Camp Merrowvista in Tuftonboro, New Hampshire. You will have a lot of friends cheering you on! Community service is available and encouraged throughout the school year. Help clean our local trails; teach seniors how to use technology; mentor community youth; join Best Buddies. There are many opportunities to help out -- the choice is yours! Why? Because you can and it's fun! The white stuff will eventually come down and there are hills right in our backyard for sledding and of course fields of snow for epic snowball fights! Jump into the lake at least once! Do the polar plunge -- for community service or just for fun, or in the warmer months, sit on the dock with friends and swim at our private beach. We are lucky to have a ski hill right in Wolfeboro. The Abenaki ski area offers both downhill and nordic trails. Participate as part of our recreational ski program, as a weekend activity or as an all-school event. This is a great place to try skiing if you never have! The "Bubble" is legendary in Wolfeboro and is one of the six or so ice cream venues in town. This is one place that you will likely visit not just once, but many times while you are at Brewster! There are plenty of opportunities to fish! Between Lake Winnipesaukee and Back Bay in Wolfeboro, it is easy to do a little fishing after class or on the weekend -- in any season! We also take trips to other local "fishing holes" and learn skills like fly tying. In addition to being within an hour of the White Mountain range, we have many local trails to enjoy. Our cross country team and advanced fitness classes regularly use the Sewall Woods trails for practice which are right in downtown Wolfeboro. Get out and enjoy the great outdoors! Dip your toes in the water and enjoy this time in your life. Make friends that you will have for a lifetime and live in a community that is relaxing, and supportive, yet challenging and rewarding and will be one of the most memorable experiences of your life. Did we mention the sunsets? Wow! We are so fortunate to live in this beautiful part of New Hampshire. We are less than an hour drive to the beaches and to the mountains and our Lake Winnipesaukee location offers a lot of fun opportunities in any season. Brewster graduates are always grateful to come "home" to campus to reminisce about the view and their time at Brewster.